Contrary to popular belief, I don’t eat all the cakes I bake myself. Nothing makes me happier than baking a cake than sharing a cake so that’s why Wayne our site manager is my regular “taste tester.” We have a convenient little arrangement where I leave cake in the lobby of our building and he gets a text when there’s cake to collect (usually just in time for morning tea!) One day, when I was in the middle of one of my regular cake drop operations I was spotted by a neighbour and we got chatting. As you do. It turned out she was keen to join my taste tester programme and so I started sharing cake with her too. Since then we haven’t just shared cakes, we’ve shared coffee, recipes and the gift of friendship. So it’s true what they say, cake really does bring people together. Anyway, the tables turned the other day, when my new friend Luce, brought me some of her homemade goodness in the form of pesto. That first jar of pesto started an obsession with the stuff and now I can’t stop and I won’t stop. It took me a while to work out my own speciality blend and now I’m totally addicted to this Kale and Basil Pesto. It also took me a while to work out that parmesan cheese is not vegetarian, so check my pesto recipe for a veggie alternative and in this recipe, swap the parmesan for any cheese of your choosing. 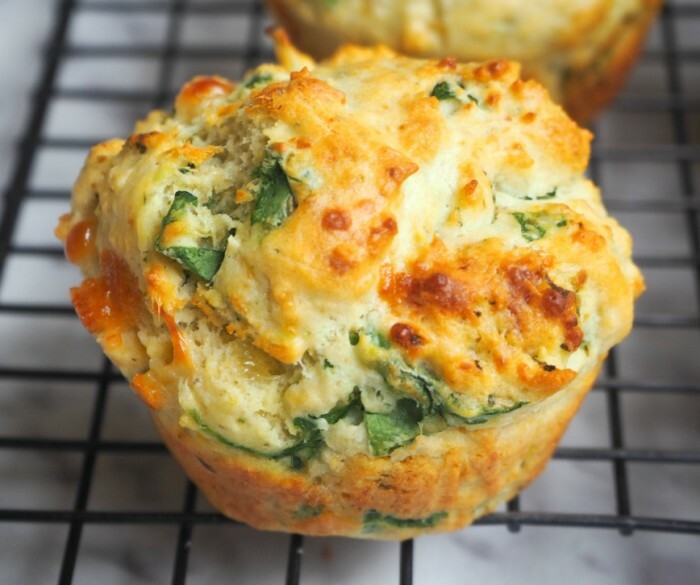 These muffins are as forgiving as they are tasty! 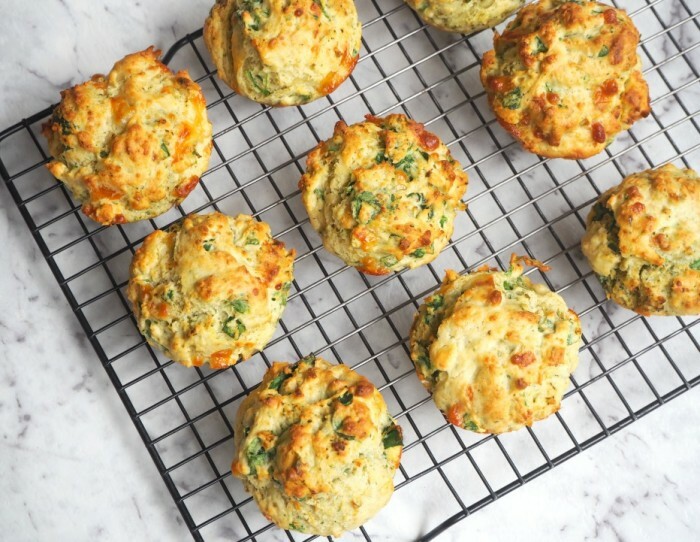 Anyways, I didn’t want to make pasta so I started to think of other delicious ways to use the pesto and that’s how the recipe for these savoury muffins was born. 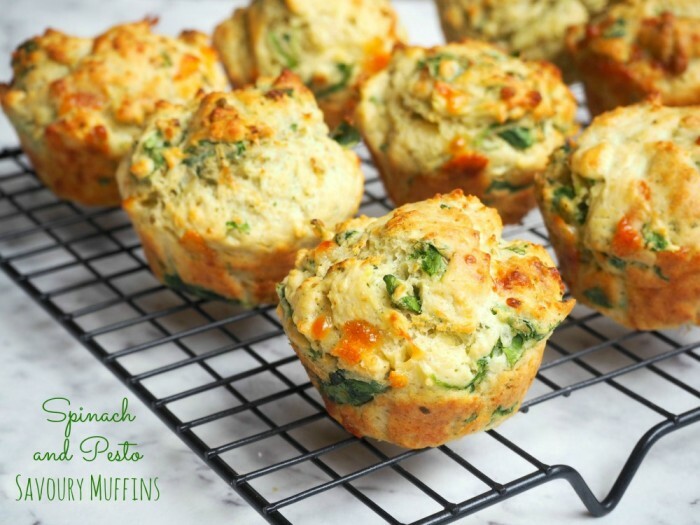 These freezer friendly muffins are the bomb diggity, if I say so myself, full of flavour from the basil in the pesto and super cheesy from the two cheese blend. They’re perfect on their own, as a mid-morning snack and they go great in lunch boxes. They’re super easy whether you make them by hand or with the Thermomix, but however you make them, they’ll be a taste sensation. So tell me, how do you use your pesto?! In a large bowl, combine the flour, spinach, pizza cheese and parmesan. In a separate bowl, whisk the eggs, milk and butter. Add the milk mixture to the flour mixture and stir with a large metal spoon until just combined. Gently stir through the pesto. The mixture will be quite sticky and lumpy – remember the lumpier the mixture, the better the muffin! Use an ice cream scoop to place the mixture in the paper cases. Bake for about 5 minutes at 200C/180C fan-forced. Then reduce the temperature to 180C/160C fan-forced and cook for another 10-15 minutes until cooked through and golden. Leave the muffins to cool in the tin for 5 minutes, then transfer to cool on a wire rack. Serve warm or cold, with lashings of butter! Grate the parmesan for l for 10 seconds on speed 8. Set aside. Melt the butter for 2 minutes at 60C on speed 2. Add the milk and the egg and mix for 10 seconds on speed 4. Add the flour, pesto, spinach and cheese and mix for 10 seconds on speed 2, using the spatula to assist. TIP! If you’re freezing these for lunch boxes, first cut the muffin in half and spread with butter – that way all you need to do is put the muffin in the lunch box straight from the freezer!